Welcome to your new adjustable height workspace! RISE UP is a premium quality, SOLID bamboo top (not veneer! ), electric standing desk with dual motors that’s designed to optimize your posture while sitting or standing. The solid steel frame is sturdy, durable, and has dual motors for a smooth, quick and quiet height adjustment and extra lift capacity. Adjusting the desk height is simple! Use the automatic up/down controls and you can store four of your favorite height settings for an even quicker adjustment. The beautiful, environment-friendly worktop is the perfect size for a comfortable office desk. 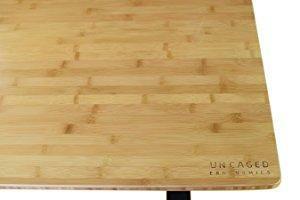 SOLID BAMBOO DESKTOP: The 60" x 30" stand up desk top is made from solid bamboo. It's not veneer or fake! The premium non-marking, scratch resistant finish wipes clean. ELECTRIC ADJUSTABLE HEIGHT STANDING DESK FRAME: Are you super tall or short? We've got you covered! The extended height adjustment range (26" to 52") fits a really wide range of users. PROGRAMMABLE MEMORY: Push-button operation. The Auto Up/Down feature plus four memory presets give you one-touch adjustments! DUAL MOTORS: Twin electric motors deliver a fast, smooth, even height adjustment, plus extra weight capacity. This durable electric standing desk safely supports 250 lbs. THREE-STAGE LIFTING COLUMNS: A three-stage design allows the desk to drop lower and rise higher than a two-stage design, giving it a much wider adjustment range. Quickly move from sitting to standing with the push of a button. Rise Up is packed with all the features you need in an ergonomic standing desk: 2-motors, memory keyboard, large bamboo worktop, anti-collision, adjustable width and more. Our premium motors have almost a decade of field-proven durability in some of the most intense offices across the globe. 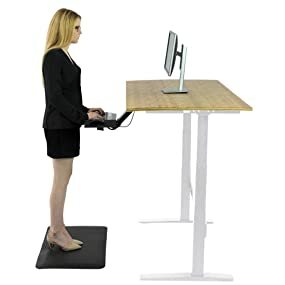 We use 2 motors, why?...dual motors enhances the longevity and allows your desk to move smoother, evenly, and faster. Self-tapping wood screws are included to connect the desktop to the frame. The color of beautiful, natural bamboo works in most office environments and lets the natural wood grain shine. Made of solid bamboo (not cheap veneer or fake wood), the desktop can safely hold screws for mounting accessories. Quickly adjust desk height with the auto up/down arrows and store your 4 favorite heights for 1-touch adjusting. 3 columns are more durable, lift heavier loads, move evenly, adjust quickly, collapse lower and extend higher. Compared to the cheap 1 motor + spindle products, 2 motors last longer and ensure your desk moves evenly, quickly and safely. Built-in technology helps prevent lowering the desk on top of an object.